*Click the damper images below to see larger pictures. Spring rate can be changed at the time of order (A price is the same). 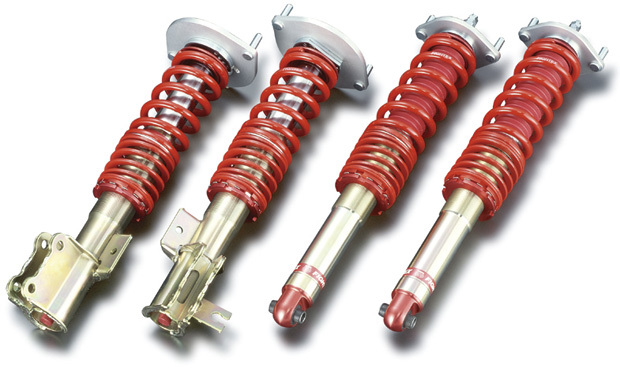 Damper KIT contents: Damper, main spring, helper spring (for certain types only), pillow-ball upper mount, spring upper seat, spring lower seat, lock seat, dust boot (rear), car height adjustment wrench, damping force adjustment wrench, instruction manual. Note: Basically Fightex damper is designed to be based on the standard upper mount. When pillow-ball upper mount kits are not available, the spring upper seat for the standard upper mount is provided.